For its yearly Opera Annex Production, playing now through February 6 at the Calderwood Pavillion, the Boston Lyric Opera presented Czech composer Viktor Ullmann’s third opera, The Emperor of Atlantis, or Death Quits. Conductor Steven Lipsitt has long been a promoter of the work of Ullmann. Written in 1943 during the composer’s two-year internment at the Czech concentration camp Terezin, the opera is haunted by the dark circumstances of its composition. Further, the opera’s brevity enhances this difficulty; few, if any, pieces in the operatic repertoire have the gravitas required to appropriately share a billing with Ullmann’s work. As a solution, the BLO commissioned a new work from American composer Richard Beaudoin to precede Ullmann’s work. Beaudoin’s The After-Image is a tableau for soprano and bass with the same instrumentation as Messian’s Quartet for the End of Time: violin, clarinet, cello and piano. With a libretto assembled by the composer from poetry and writings by Rilke, Rückart and William Talbot, the work provided an appealing opening to the evening. The tableau intimately portrays a young woman’s fleeting memory of her deceased soldier/father as manifest in an old, decaying photograph of the man in his youth. As the daughter, mezzo-soprano Jamie Van Eyck gracefully supplied an excellent contrast to the other-worldly bass of Kevin Burdette, the Father’s spirit. Perhaps as an expression of the distance between the two characters, one in life, the other in death, Beaudoin never permits the two characters to sing a due. While the opportunity for an operatic double-soliloquy is lost, what the audience gains is an unremitting velvet tension appropriate to the unresolved distance between these characters. This tension is complemented by David Schweizer’s staging of the piece as a “pseudo concert” in a setting somewhat reminiscent of a Biedermeyer living room. As a solution to the difficulty of transitioning to the Ullmann piece, Schweizer replaced the obligatory intermission with uniformed soldiers who rudely interrupt the warmth of Beaudoin’s piece and rip the background curtains down to reveal the post-apocalyptic setting of the The Emperor of Atlantis. 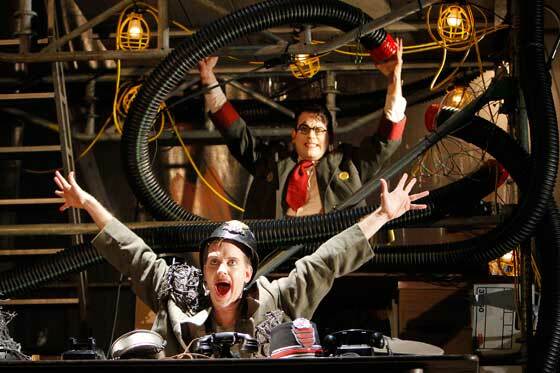 A one-act opera to a libretto written by Peter Kien and translated (mostly) into English for this production, The Emperor of Atlantis is essentially a moral tale that tells of the demise and redemption of a totalitarian ruler, Emperor Überall. The Emperor, played by baritone Andrew Wilkowske, declares a “great war of all against all” and calls for an anthropomorphized death to lead the march “in the name of our great future and your great past.” Death, played by Burdette, gnashes his teeth at the Emperor’s impertinence and refuses to cooperate by no longer allowing people to die. As the bodies of the living dead begin to pile up, Ullmann creates several darkly humorous moments, not least of which include the two macabre dances, one for death, the other for the living dead (lebenden toten). Yet he also creates moments of remarkably poignancy. 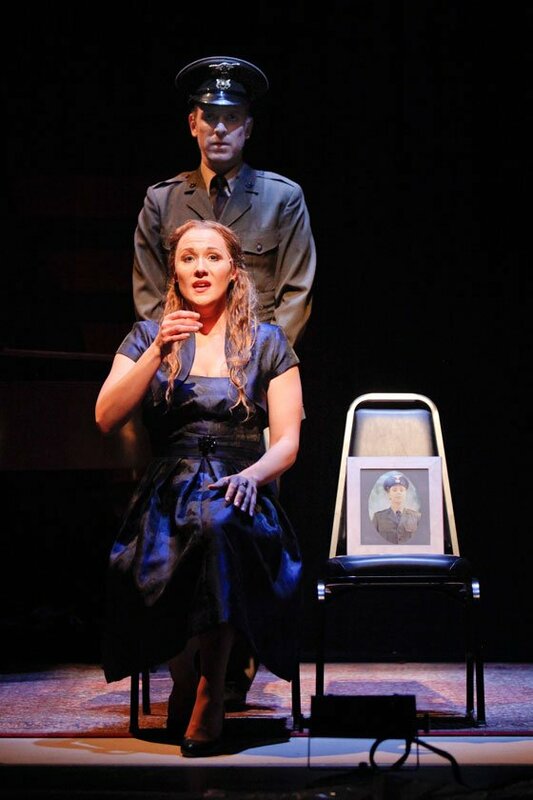 In the third scene, when death fails to take either the soldier (tenor Julius Ahn), or his enemy, the soldier girl (soprano Kathryn Skemp), the two soldiers decide to turn instead to love, in a duet sung exquisitely by Ahn and Skemp. In the next number, the Emperor’s Redemption (in which the Emperor decides to give his own life in order that death can begin anew), Wilkowske employed his warm and vibrant baritone to accomplish the most difficult task of the opera — humanizing the Emperor enough so that his redemption in death is understood as an act of warm generosity. The work ended with a stirring ensemble rendition of Bach’s chorale, “Ein Feste Burg” with a different text that is surely an overt reference by Ullmann to Meyerbeer’s use of the same chorale to close his own moral tale, Les Huguenots. One of the most remarkable aspects of Ullmann’s score is his fluent employment of an orchestra whose instruments were determined by the conditions at Terezin. These, in turn, seemed to determine the work’s musical style, an amazing collage of blues, cabaret, singspiel, and highbrow classical played on instruments as diverse as a tenor banjo and harmonium. The Ullmann is so referential with so many other motives from other pieces it is difficult to pin down anything idiosyncratically his. Ultimately, however, it is the humanity of the work that marks its genius. At the “talk-back” after the concert, several of the performers puzzled over the fact that Ullmann reserved the most beautiful music for the Emperor’s final aria. Why, they questioned, would Ullmann write such beautiful music for a character who is clearly a reference to Hitler himself? This critic believes that Ullmann did not reserve the music for the character, but for the moment and the act of redemption. It is truly a testament to the generosity of the human condition that Ullmann and Kien, while at Terezin and months away from their own execution, could imagine any redemption, not to mention one for Hitler. Our venue is under repair. Ed. Note: Additions have been made to this article. I would have expected some mention of the work of conductor Steven Lipsitt – a resident of the Boston area, longtime champion of the music of Viktor Ullmann and the conductor of the Boston and New York premieres of this piece some years back, if I’m not mistaken. Right, Michael- Steven Lipsitt conducted a concert version of “Atlantis” at Northeastern 10 or so years ago. He borrowed my harmonium for that performance while using an electronic keyboard this time. Lipsitt clearly has real connections with this piece and I agree that the omission of any mention of him is strange. That is completely my oversight. Maestro Lipsitt’s rendering carried the pace and warmth of someone with an intimate knowledge of the score–from both a musical and dramatic standpoint. This production clearly leaves Zagrosek’s and all of the other recorded productions sounding cold and robotic. One wishes that Lipsitt might find his way into the studio to document this remarkable production! Surely? Forget about Mendelssohn, Luther, BWV 80, and the military imagery of “feste Burg”! Yes surely. I didn’t forget about them and neither did Meyerbeer. Everyone likes to talk about the Mendelssohn, Bach, and Luther settings (why not site Buxtehude, Wagner, Reger, Vaugh Williams and Pachebel while you are at it). Meyerbeer’s Les Huguenots, where the theme is also employed in the context of criticizing crimes committed in the name of religion, seemed to me to be the most similar (and relevant) previous setting. Further, while Meyerbeer’s works all but disappeared during W.W.II it is silly to think that Ullmann didn’t know Les Huguenots, an opera which, early in the 20th century, was often cited as the “most popular opera of the 19th Century.” Thanks for Reading! In case anyone is still reading this thread, there was also a production of Ullmann’s “The Emperor of Atlantis” by B.U.’s Opera Institute in approximately 2002. It was part of the annual Fringe Festival which that year dealt with works from the Terezin concentration camp. It featured Alok Kumar (then a baritone) in the title role and was my introduction to this fascinating piece.